At our beach-home in Tanglewood you will find all the comforts and amenities you will need to help you focus on simply enjoying your time away. Our 1283 square foot 3 bedroom, 2 bathroom home is on a single floor so there are no stairs to maneuver. The master bedroom has a king bed and a beautiful ensuite with a glassed-in shower and soaker tub . The second bedroom has a queen bed and the third bedroom has 2 twins. The second bathroom features a glassed-in shower and heated floor. The kitchen boasts a full compliment of stainless steel appliances which include a microwave, garburator and a side by side refrigerator with a water and ice dispenser. Also featured is a beautiful four seater granite eating island, perfect for entertaining. The open concept design with the ceiling reaching up to 17 feet allows for plenty of natural light. A corner gas fireplace and window seat add to the comforts of the great room with it's 42' flat screen TV, Bluray,DVD/VHS and a game system. Also included are an in unit washer and dryer, built in vac system, high speed internet/WI-FI and telephone for local calls. 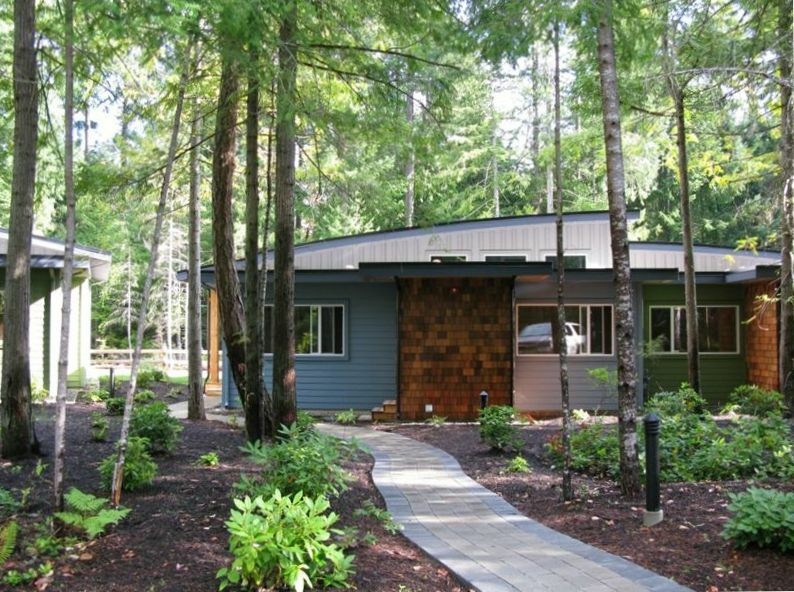 The private patio features a natural gas bar-b-que and offers a tranquil forest view. Beach chairs, beach toys and towels are there for your personal use. We have the world class Grotto Spa at Tigh na Mara just down the road along with a mini golf course the whole family can enjoy. For a more challenging game of golf Qualicum boasts several extraordinary courses. Our beach house backs onto 347 hectares of Rathtrevor Provincial Park and often have island wildlife at our doorstep. Rathtrevor beach is a few minutes walk down a private road where the tide goes out for nearly a kilometer creating a spectacular sandy playground for young and old. Whatever your vacation needs, we're certain our Tanglewood beach home will be the perfect setting for a comfortable and memorable holiday. 2 full bathrooms include 2 showers , one tub. WE are adjacent to Rathtrevor Provincial Park. Literally it is in our backyard, so its quiet and many deer with their fauns. WE walk 3 minutes at a childs pace down our private drive to the beach. WE are only booking 27 days minimum for the time being. Call for summer availability .